Cholesterol, pictured here, binds to low-density lipoprotein to be transported in the blood stream. Low-density lipoprotein (LDL) is one of several complexes of lipids and proteins that transport cholesterol and triglycerides in the circulatory system. The other four major groups of lipoproteins are chylomicrons, very low-density lipoprotein (VLDL), intermediate-density lipoprotein (IDL), and high-density lipoprotein (HDL). Like all lipoproteins, LDL enables fats and cholesterol, which are insoluble in water, to move within the water-based solution of the blood stream. LDL also regulates cholesterol synthesis. The cholesterol bound to LDL also is referred to as bad cholesterol because it is thought to have deleterious health impacts. LDL commonly appears in the medical setting as part of a cholesterol blood test, where high levels of LDL cholesterol can signal medical problems like cardiovascular disease. There are steps that people can take to reduce LDL for health reasons. Included among these are lifestyle changes as reflected in dietary changes, such as lowering carbohydrate intake and triglyceride intake, and also through the use of drugs such as statins or niacin. Cholesterol plays a central role in many biochemical processes. It is a major constituent in the cell membranes of animals and serves as a precursor of important hormones and other substances. Cholesterol, however, is insoluble in blood and is transported in the circulatory system bound to one of the varieties of lipoprotein. These lipoproteins have an exterior composed mainly of water-soluble proteins. They bind to lipids like cholesterol and triglycerides and allow them to be transported within the water-based blood stream. In recent years, the term "bad cholesterol" is used to refer to cholesterol contained in LDL, thought to have harmful actions, while the term "good cholesterol" or "healthy cholesterol" is used to refer to cholesterol contained in HDL (high density lipoprotein), which is thought to have beneficial health impacts (AMA 2008). However, good and bad cholesterol is a misnomer. The cholesterol transported on LDL is the same as cholesterol transported on other lipoprotein particles. The cholesterol itself is not "bad;" rather, it is how and where the cholesterol is being transported, and in what amounts over time, that causes adverse effects. Each native LDL particle contains a single apolipoprotein B-100 molecule (Apo B-100, a protein with 4536 amino acid residues), which binds the fatty acids, keeping them soluble in an aqueous environment. In addition, LDL has a highly-hydrophobic core consisting of polyunsaturated fatty acids known as linoleate and about 1500 esterified cholesterol molecules. This core is surrounded by a shell of phospholipids and unesterified cholesterol, as well as a single copy of B-100 large protein (514 kD). LDL particles are approximately 22 nm in diameter and have a mass of about 3 million daltons, but since LDL particles contain a changing number of fatty acids, they actually have a mass and size distribution (Segrest et al. 2001). Very low-density lipoprotein (VLDL) is converted in the bloodstream to low-density lipoprotein. LDL is formed as VLDL lipoproteins lose triglycerides through the action of lipoprotein lipase (LPL) and become smaller and denser, containing a higher proportion of cholesterol. LDL particles vary in size and density, and studies have shown that a pattern that has more small, dense LDL particles (called "Pattern B") equates to a higher risk factor for coronary heart disease (CHD) than does a pattern with more of the larger and less dense LDL particles ("Pattern A"). This is because the smaller particles are more easily able to penetrate the endothelium. "Pattern I," meaning "intermediate," indicates that most LDL particles are very close in size to the normal gaps in the endothelium (26 nm). The correspondence between Pattern B and coronary heart disease has been suggested by some in the medical community to be stronger than the correspondence between the LDL number measured in the standard lipid profile test. Tests to measure these LDL subtype patterns have been more expensive and not widely available, so the common lipid profile test has been used more commonly. There has also been noted a correspondence between higher triglyceride levels and higher levels of smaller, denser LDL particles and alternately lower triglyceride levels and higher levels of the larger, less dense LDL (Superko et al. 2002; Warnick et al. 1990). With continued research, decreasing cost, greater availability, and wider acceptance of other "lipoprotein subclass analysis" assay methods, including NMR spectroscopy, research studies have continued to show a stronger correlation between human clinically obvious cardiovascular event and quantitatively-measured particle concentrations. When a cell requires cholesterol, it synthesizes the necessary LDL receptors, and inserts them into the plasma membrane. The LDL receptors diffuse freely until they associate with clathrin-coated pits. LDL particles in the blood stream bind to these extracellular LDL receptors. The clathrin-coated pits then form vesicles that are endocytosed into the cell. After the clathrin coat is shed, the vesicles deliver the LDL and their receptors to early endosomes, onto late endosomes, to lysosomes. Here the cholesterol esters in the LDL are hydrolysed. The LDL receptors are recycled back to the plasma membrane. LDLs transport cholesterol to the arteries and can be retained there by arterial proteoglycans, starting the formation of plaques that hinder blood flow. Thus, increased levels of LDLs are associated with atherosclerosis, and thus heart attack, stroke, and peripheral vascular disease. It is for such reasons that cholesterol inside LDL lipoproteins is often known as "bad" cholesterol. Increasing evidence has revealed that the concentration and size of the LDL particles more powerfully relates to the degree of atherosclerosis progression than the concentration of cholesterol contained within all the LDL particles (Taubes and Krauss 2007). The healthiest pattern, though relatively rare, is to have small numbers of large LDL particles and no small particles. 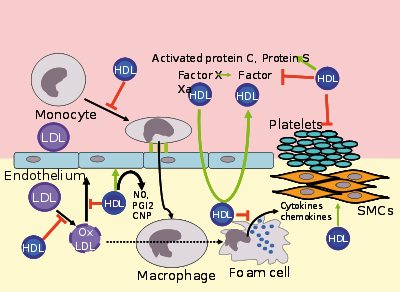 Having small LDL particles, though common, is an unhealthy pattern; high concentrations of small LDL particles (even though potentially carrying the same total cholesterol content as a low concentration of large particles) correlates with much faster growth of atheroma, progression of atherosclerosis, and earlier and more severe cardiovascular disease events and death. A hereditary form of high LDL is familial hypercholesterolemia (FH). Increased LDL is termed hyperlipoproteinemia type II (after the dated Fredrickson classification). LDL poses a risk for cardiovascular disease when it invades the endothelium and becomes oxidized, since the oxidized form is more easily retained by the proteoglycans. A complex set of biochemical reactions regulates the oxidation of LDL, chiefly stimulated by presence of free radicals in the endothelium. Nitric oxide down-regulates this oxidation process catalyzed by L-arginine. In a corresponding manner, when there are high levels of asymmetric dimethylarginine in the endothelium, production of nitric oxide is inhibited and more LDL oxidation occurs. There are a variety of methods to lower LDL for improvement of health, ranging from lifestyle changes, such as diet, to drugs designed to reduce LDL. The mevalonate pathway serves as the basis for the biosynthesis of many molecules, including cholesterol. An essential component of this pathway is the enzyme 3-hydroxy-3-methylglutaryl coenzyme A reductase (HMG CoA reductase). The use of statins (HMG-CoA reductase inhibitors) is effective against high levels of LDL cholesterol. Statins inhibit the enzyme HMG-CoA reductase in the liver, the rate-limiting step of cholesterol synthesis. To compensate for the decreased cholesterol availability, synthesis of LDL receptors is increased, resulting in an increased clearance of LDL from the blood. Clofibrate is effective at lowering cholesterol levels, but has been associated with significantly increased cancer and stroke mortality, despite lowered cholesterol levels (WHO 1984). Torcetrapib was a drug developed to treat high cholesterol levels, but its development was halted when studies showed a 60% increase in deaths when used in conjunction with atorvastatin versus the statin alone (Agovino 2006). Niacin (B3) lowers LDL by selectively inhibiting hepatic diacyglycerol acyltransferase 2, reducing triglyceride synthesis and VLDL secretion through a receptor HM74 (Meyers et al. 2004) and HM74A or GPR109A (Soudijn et al. 2007). Tocotrienols, especially δ- and γ-tocotrienols, have been shown to be effective nutritional agents to treat high cholesterol in recent research programs. In particular, γ-tocotrienol appears to act on a specific enzyme called 3-hydroxy-3-methylglutaryl-coenzyme and suppressed the production of this enzyme, which resulted in less cholesterol being manufactured by liver cells (Song and DeBose-Boyd 2006). Insulin induces HMG-CoA reductase activity, whereas glucagon downregulates it. While glucagon production is stimulated by dietary protein ingestion, insulin production is stimulated by dietary carbohydrate. The rise of insulin is, in general, determined by the digestion of carbohydrates, broken down into glucose, and subsequent increase in serum glucose levels. Glucagon levels are very low when insulin levels are high. A ketogenic diet, which is one low in carbohydrates but with adequate protein and high fat, may have a similar response to taking niacin (lowered LDL and increased HDL) through beta-hydroxybutyrate, a ketone body, coupling the niacin receptor (HM74A) (Esterbauer et al. 1991). Lowering the blood lipid concentration of triglycerides helps lower the amount of LDL, because it lowers the amount of very low density lipoprotein, and VLDL gets converted in the bloodstream into LDL. Fructose, a component of sucrose as well as high-fructose corn syrup, upregulates hepatic VLDL synthesis, resulting in more VLDL and thus more LDL (Basciano et al. 2005). Because LDL appears to be harmless until oxidized by free radicals (Teissedre et al. 1996), it is postulated that ingesting antioxidants and minimizing free radical exposure may reduce LDL's contribution to atherosclerosis, though results are not conclusive (Esterbauer et al. 1991). Chemical measures of lipid concentration have long been the most-used clinical measurement, not because they have the best correlation with individual outcome, but because these lab methods are less expensive and more widely available. However, there is increasing evidence and recognition of the value of more sophisticated measurements. To be specific, LDL particle number (concentration), and to a lesser extent size, have shown much tighter correlation with atherosclerotic progression and cardiovascular events than is obtained using chemical measures of total LDL concentration contained within the particles. LDL cholesterol concentration can be low, yet LDL particle number high and cardiovascular events rates high. Also, LDL cholesterol concentration can be relatively high, yet LDL particle number low and cardiovascular events also low. These guidelines were based on a goal of presumably decreasing death rates from cardiovascular disease to less than 2 to 3 percent per year or less than 20 to 30 percent every 10 years. Note that 100 is not considered optimal; less than 100 is optimal, though it is unspecified how much less. Over time, with more clinical research, these recommended levels keep being reduced because LDL reduction, including to abnormally low levels, has been the most effective strategy for reducing cardiovascular death rates in large double blind, randomized clinical trials (Shepherd et al. 1995); far more effective than coronary angioplasty/stenting or bypass surgery. For instance, for people with known atherosclerosis diseases, the 2004 updated American Heart Association, NIH and NCEP recommendations are for LDL levels to be lowered to less than 70 mg/dL, unspecified how much lower. It has been estimated from the results of multiple human pharmacologic LDL lowering trials that LDL should be lowered to about 50 to reduce cardiovascular event rates to near zero. For reference, from longitudinal population studies following progression of atherosclerosis-related behaviors from early childhood into adulthood, it has been discovered that the usual LDL in childhood, before the development of fatty streaks, is about 35 mg/dL. However, all the above values refer to chemical measures of lipid/cholesterol concentration within LDL, not LDLipoprotein concentrations, probably not the better approach. Agovino, T. 2006. Pfizer ends cholesterol drug development. Associated Press Sunday, December 3, 2006. Retrieved January 23, 2009. American Heart Association (AHA). 2008. LDL and HDL cholesterol: What's bad and what's good? American Heart Association. Retrieved January 23, 2009. Basciano, H., L. Federico, and K. Adeli. 2005. Fructose, insulin resistance, and metabolic dyslipidemia. Nutrition & Metabolism 2: 5. Retrieved January 23, 2009. Cromwell, W. C., and J. D. Otvos. 2004. Low-density lipoprotein particle number and risk for cardiovascular disease. Curr Atheroscler Rep 6(5): 381–7. PMID 15296705. Retrieved January 23, 2009. Esterbauer, H., H. Puhl, M. Dieber-Rotheneder, G. Waeg, and H. Rabl. 1991. Effect of antioxidants on oxidative modification of LDL. Ann Med. 23(5):573-81. Retrieved January 23, 2009. Friedewald, W. T., R. I. Levy, and D. S. Fredrickson. 1972. Estimation of the concentration of low-density lipoprotein cholesterol in plasma, without use of the preparative ultracentrifuge. Clin. Chem. 18(6): 499–502. PMID 4337382. Retrieved January 23, 2009. King, M. W. 2008. Regulating cholesterol synthesis. The Medical Biochemistry Page. Retrieved January 23, 2009. Meyers, C. D., V. S. Kamanna, and M. L. Kashyap. 2004. Niacin therapy in atherosclerosis. Curr Opin Lipidol. 15(6):659-65. PMID 15529025. O'Keefe, J. H., L. Cordain, L. H. Harris, R. M. Moe, and R. Vogel. 2004. Optimal low-density lipoprotein is 50 to 70 mg/dl: Lower is better and physiologically normal. J. Am Coll Cardiol 43(11): 2142–6. PMID 15172426. Retrieved January 23, 2009. Segresta, J. P., M. K. Jones, H. de Loof, and N. Dashti. 2001. Structure of apolipoprotein B-100 in low density lipoproteins. Journal of Lipid Research 42: 1346–1367. Retrieved January 23, 2009. Shepherd, J., S. M. Cobbe, I. Ford, C. G. Isles, A. R. Lorimer, P. W. MacFarlane, J. H. McKillop, and C. J. Packard. 1995. Prevention of coronary heart disease with pravastatin in men with hypercholesterolemia. N Engl J Med. 333(30): 1301–1307. PMID 7566020. Retrieved January 23, 2009. Sniderman, A. D., D. Blank, R. Zakarian, J. Bergeron, and J. Frohlich. 2003. Triglycerides and small dense LDL: The twin Achilles heels of the Friedewald formula. Clin. Biochem. 36(7): 499–504. PMID 14563441. Retrieved January 23, 2009. Song, B. L., and R. A. DeBose-Boyd. 2006. Insig-dependent ubiquitination and degradation of 3-hydroxy-3-methylglutaryl coenzyme A reductase stimulated by delta- and gamma-tocotrienols. J. Biol. Chem. 281(35): 25054-25601. Soudijn, W., I. van Wijngaarden, and A. P. Ijzerman. 2007. Nicotinic acid receptor subtypes and their ligands. Med Res Rev. 27(3): 417-33. PMID 17238156. Retrieved January 23, 2009. Superko, H. R., M. Nejedly, and B. Garrett. 2002. Small LDL and its clinical importance as a new CAD risk factor: A female case study. Prog Cardiovasc Nurs 17(4): 167–73. PMID 12417832. Retrieved January 23, 2009. Taubes, G., and R. Krauss 2007. Not all calories are created equal, author says. Talk of the Nation discussion. National Public Radio November 2, 2007. Retrieved January 23, 2009. Teissedre, P. L., E. N. Frankel, A. L. Waterhouse, H. Peleg, and J. B. German. 1996. Inhibition of in vitro human LDL oxidation by phenolic antioxidants from grapes and wines. J-sci-food-agric. 70(1): 55-61. Retrieved January 23, 2009. Warnick, G. R., R. H. Knopp, V. Fitzpatrick, and L. Branson. 1990. Estimating low-density lipoprotein cholesterol by the Friedewald equation is adequate for classifying patients on the basis of nationally recommended cutpoints. Clinical Chemistry 36: 15-19. Retrieved January 23, 2009.
WHO. WHO cooperative trial on primary prevention of ischaemic heart disease with clofibrate to lower serum cholesterol: final mortality follow-up. Report of the Committee of Principal Investigators. [No authors listed] 1984. Lancet 2(8403): 600-4. PMID 6147641. Retrieved January 23, 2009. History of "Low density lipoprotein"
This page was last modified on 24 January 2009, at 20:28.